some thoughts on “in 4 the evening”…. This week, when the masters come back, look for a release and free download of an advance track from the album, either “Paradise by the Lava Lamp” or “Piñon Incense,” probably the latter. Originally, when I started recording some new songs in late June and July of last year, they were for what I thought was only going to be an EP to be released by the end of 2011. 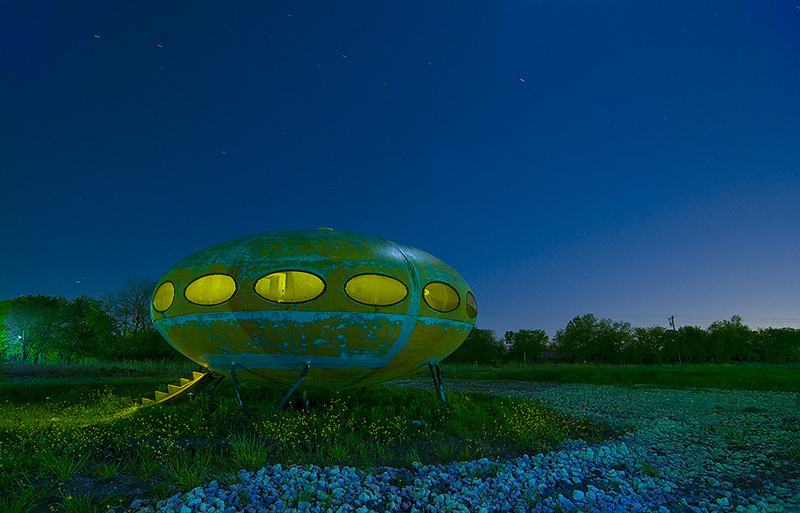 By the beginning of last August I’d come up with a title: the album would be called “In 4 the Evening,” a loose concept based almost entirely on Noel Kerns’ photograph of the ‘Futuro House’ which became the front cover of the album. Full image of the “Futuro House”…. photograph by Noel Kerns. Personally, I like the idea of ‘concept’ albums, even if they’re loosely-based ones. It keeps the musical ideas more focused around a central theme – otherwise there could be the tendency to include a lot of eclectic and divergent ideas which could end up making the album sound a tad disjointed (I’m real big on cohesiveness these days – didn’t used to be). I was already familiar with Noel’s work since I’d used his photograph of Stanley Marsh’s ‘Cadillac Ranch’ near Amarillo for the cover of the first album. I love night photography, especially when it features ruins or abandoned places, and I love his work. He has a book coming out of his photography – if it’s not out already – called “Nightwatch: Painting with Light” and you can find it here on Amazon (also, check out the link under Blogroll at right to check out some of his work on Flickr). The ‘Futuro House’ is kind of interesting in itself… the story goes that apparently these structures were some type of pre-fab housing that were manufactured in the late 1940’s after the war and you could buy one for a few hundred bucks, have yours set up wherever you wanted and actually live in it. A few of them still exist in Texas, where the photograph was taken, although since the construction is metal, it’s hard to imagine actually living in one of these things as they would become the equivalent of a dutch oven in the summer. Put a few swamp coolers on top of it? Anyway, I knew I wanted to use the image on the cover and organized kind of a loose concept for the album around it and the whole idea of just ‘staying in,’ ‘staying home’ and songs for the evening… which turned out to be unusually prophetic. I was still living in Dallas at the time and still thinking this was going to be an EP. By the time I moved back to Colorado and moved in with my girlfriend, Erin, another couple of songs had been recorded and the EP was becoming a full-blown album. The prophetic part of the album title – and somewhat ironic as well in its prophetic-ness – came about when I got back up to Golden. Erin’s mother has been living here as well over these last 6 months (actually slightly longer); Lee is 83 years old and has Alzheimer’s, so Erin and I tag team up on caring for her here during the days and nights – with supplemental help from a local home health care service as needed – and apart from a quick overnight jaunt down to Santa Fe to see Todd Rundgren in concert at the end of March, we have literally been “In 4 the Evening”… every night. If you’ve been following this blog, you also know there’s been the move to a larger house thrown in there as well. Fortunately, both Erin and I tend to be ‘homebodies’; as we’ve been doing this, it’s been something of a running joke between us about how the album title ‘manifested’ itself in a very real and unforeseen way (funny how life works). As for the new album… the songs are more stylistically diverse, slightly more uptempo and shorter, and in contrast to the first album, not quite as moody and introspective – in fact, they’re almost downright ‘happy.’ I think it’s a stronger album overall… and it arrives May 27th on CD Baby, iTunes, et al. CDs may take a little longer initially – working on distribution details right now – and will be available through Amazon, CD Baby, and the NoV website… which I now need to start updating. 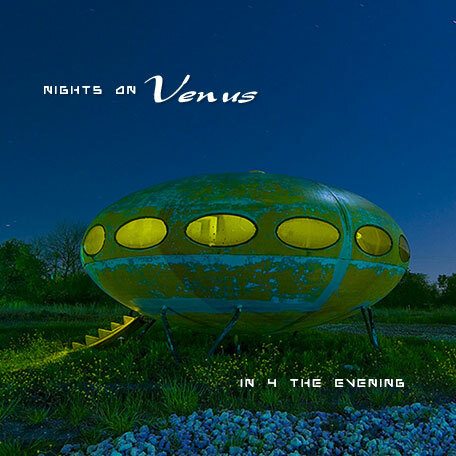 The Nights on Venus debut album is currently available as a digital download (MP3) and can be found on CDBaby, iTunes, Amazon.mp3, eMusic, and other fine online retailers. The new album “In 4 the Evening” will be released May 27th, 2012. Previous Previous post: final mixes: some thoughts on mastering prep….